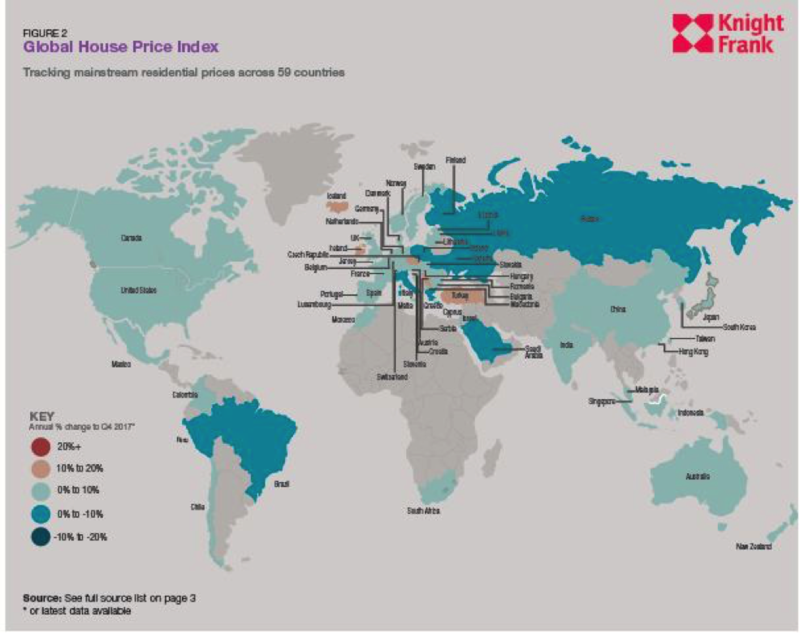 The latest house price rankings provide a glimpse as to where the world’s housing markets are in relation to their property market cycles, as the era of economic stimulus comes to a close and rate rises occupy the minds of policymakers in several key western markets. 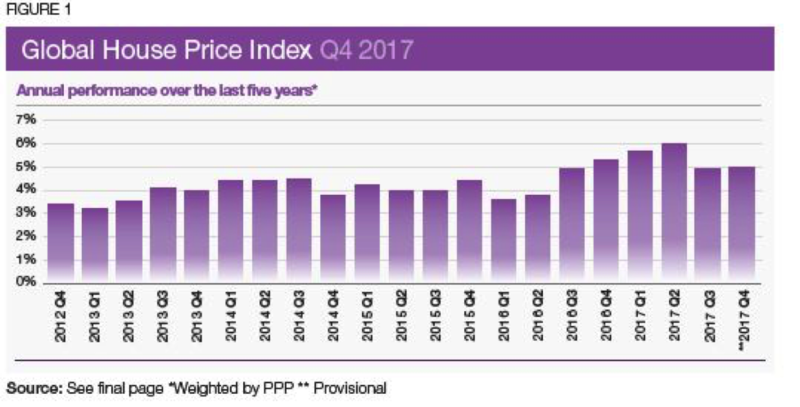 The Global House Price Index, which tracks the movement in mainstream house prices on a country basis, ended 2017 4.6% higher. Lower than 2016’s 5.3% but a reflection of steady growth nonetheless, tied primarily to the fact the global economy registered growth of 3.7% in 2017. That is not to say there aren’t headwinds. Rising interest rates in the US, UK, and Canada as well as the withdrawal of stimulus is influencing buyer sentiment, and with over 13 countries pegged to the US dollar, further rate rises by the Federal Reserve will have repercussions beyond US shores. 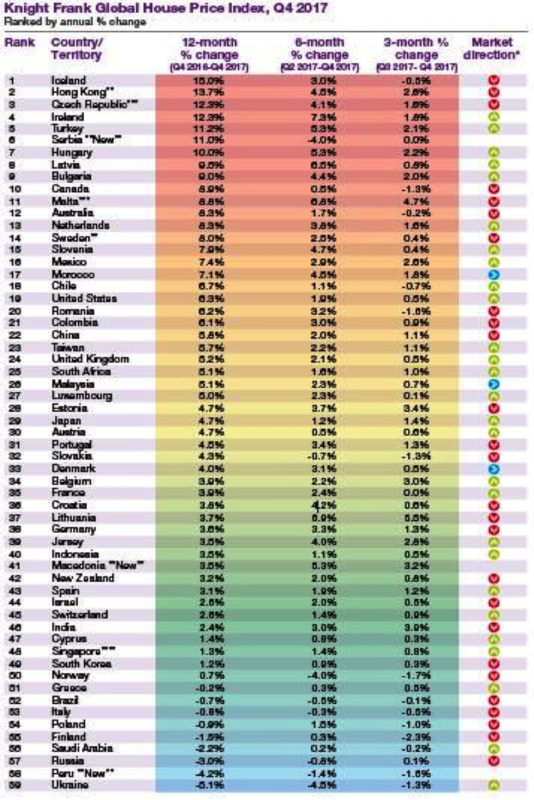 The index’s more moderate rate of growth is reflected throughout the rankings. The gap between the strongest and weakest-performing housing market has narrowed from 27 percentage points last quarter to 20. Iceland and Hong Kong still occupy first and second position but their rates of annual growth have slipped from 20% to 15% and from 18% to 14% respectively since last quarter. Mirroring a trend seen in our prime residential indices, European countries are rising up the rankings. 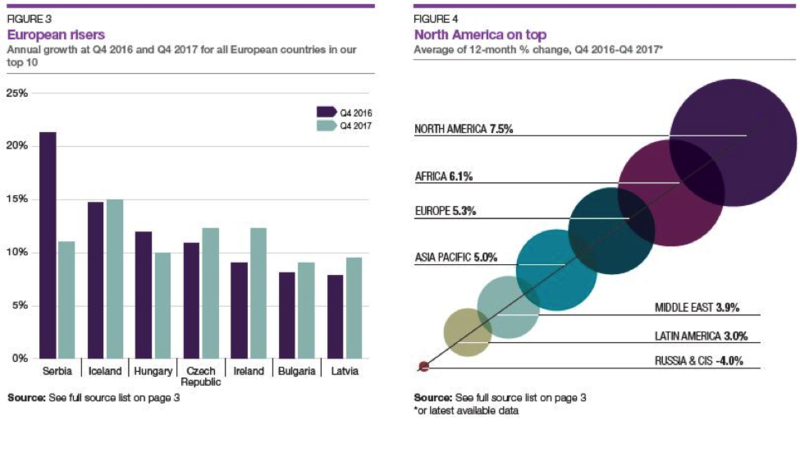 Seven of the top ten rankings equate to European countries this quarter. Alongside Iceland, these include the Czech Republic, Hungary, Ireland, Serbia, Bulgaria and Latvia; all registering annual growth in excess of 9% in 2017. In terms of the world’s largest economies, the US (6.3%) has overtaken China (5.8%) this quarter as GDP and employment figures boost market sentiment. In China, although tighter capital controls are limiting cross-border flows, policy levers at home are having some success stemming its tide into domestic markets. The strong performance of the US and Canada (8.9%) means North America outpaces all other world regions in 2017, recording average price growth of 7.5% (figure 4). With a raft of new measures announced to curb Vancouver’s price Inflation and further rate rises mooted we may see Canada shift down the rankings during 2018. Russia and the CIS remains the weakest performing world region with prices falling on average by 4% in 2017. For several years, Australia and New Zealand’s markets moved largely in tandem, but they have now diverged. Australia sits in 12th place with growth of 8.3% year-on-year, whilst New Zealand, at 3.2%, has sunk to 42nd place, no doubt, influenced by plans to halt the purchase of existing homes by foreign buyers. With 2018 set to see the normalisation of monetary policy, albeit at a gradual rate, it’s likely that the index’s performance may moderate further in the coming months.